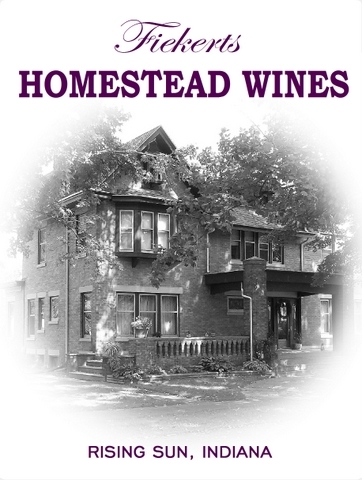 Nestled in the heart of picturesque Rising Sun, Indiana, you will find Fiekerts HOMESTEAD WINES. Our custom winery is located in a 105 year old home, where you can select from an extensive collection of red, white, and specialty wines. Each individual batch of wine is hand crafted using the finest juices, grapes, and berries which have been sourced locally and from highly sought after wine regions from around the world. We then carefully monitor each batch from the initial fermentation to the final bottling. Since we start with very high quality juices and fruits, they ferment into excellent, smooth, low sulfite wines that are comparable to commercial wines of more than double the cost. Our goal is to give you great wine at an affordable price and the best wine experience available. Please give us a call today to visit our wine cellar and schedule your FREE wine tasting. We’re open most days from noon-6pm, but please call before stopping by if possible. We wouldn’t want to miss you because we had to run an errand! NEW!! Try our newest selection… Elderberry Wine…You’re going to love it! !